Our feature stories may come from many different sources. They may be regular people, field professionals, or non-profit organizations. But, they all have one purpose in common, supporting the Asian elephant. Read about how their special efforts have helped. All interviews are in original language. Just in time for the holidays, Elemotion Foundation is releasing our amazing time-lapse video of Mayuka Thais’ life size baby Asian elephant painting. Elemotion Foundation thanks the donors, the Tokyo based art students, and Mayuka. Please enjoy the video and this artist’s wonderful talent. The painting was completed in early September 2013. After running out of time in the Tokyo art studio, we transferred the painting to the Elemotion Foundation office. It was a tight fit, but we made it work. Our cats were very interested in the large painting on the floor. Despite one purple paw print, Mayuka managed to finish in time. It has been shipped to Los Angles where it will be used for the school talks and elephant awareness programs. Mayuka’s Tokyo based art students have done an excellent job! They have helped to prepare the canvas from scratch! Once the signature rivets were added and the grid was measured, Mayuka completed the outline. The students then applied a green base coat for the baby elephant. It is now time for the artistry to start. Mayuka has spent hours on the first applications of color. Now that summer school is over, Mayuka, the students and Laurene, Elemotion Foundation’s founder, met in the studio to see the progress. Mayuka Thais is an American artist whose passion for education and wildlife conservation creates captivating ‘big-time’ art. Why ‘big-time’ you ask? Well, her elephant themed work includes the hit song, ‘When Elephants Cry’ and an amazing life-size painting of the LA zoo’s Asian elephant Billy. Her creations inspire people to get involved and discuss the problems facing elephants today. When standing next Billy’s painting, you feel the enormity, the strength, and the power of the elephant. You can also feel the enormity of their plight. 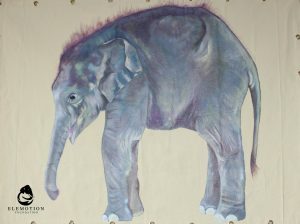 This new art project is the creation of a life size baby Asian elephant painting. 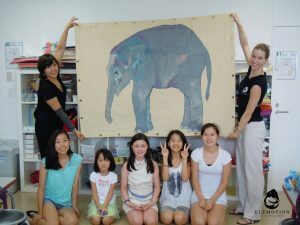 Once finished, the painting will be displayed in galleries, used in schools talks, and Asian elephant awareness programs in the United States. The original painting will not be sold for money, but instead, used to ignite educational dialogues about these incredible animals. Elemotion Foundation supports this young artist in her endeavor to educate and inspire children and adults through art. Because these paintings are so large, Mayuka needed funds to cover the cost of materials. Elemotion Foundation raised $955 US to cover costs of supplies and material for this educational cause. 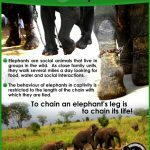 “Founded in February of 2012, Elephant Advocacy is working to increase your awareness of current issues affecting endangered elephants, fuel the passion needed to serve, protect and preserve elephants and inspire you to take action locally and globally that facilitates the survival, dignity and well-being of elephants in the wild and in captivity. We support the efforts of NGO’s working on behalf of both Asian and African elephants. We support and design campaigns and educational resources promoting the welfare and liberty of elephants around the globe. 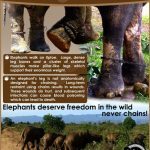 Please visit Elephant Advocacy’s website, www.elephantadvocacy.org, to discover their latest campaign for Sri Lankan temple elephants. Sri Lanka is home to more than 4,000 wild elephants. Consequently, the country has several organizations and individuals working on wild elephant conservation. Nevertheless, the country’s 200 captive elephants must not be forgotten. But sadly, captive elephant welfare seems to be greatly neglected. 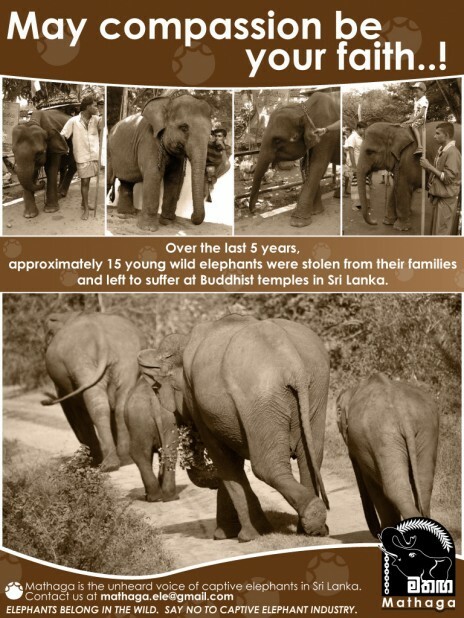 Buddhism, the primary religion in Sri Lanka is based on compassion, yet it is disappointing to see that captive animals, particularly elephants, are often badly treated. These elephants work in festivals, temples, and a freshly budding tourism industry. The conditions in which these elephants are kept and worked are much less than ideal and oftentimes horrific. Mathaga is a new organization giving a voice to these elephants in need. It is made of a team of volunteers which is interested in captive elephant welfare. 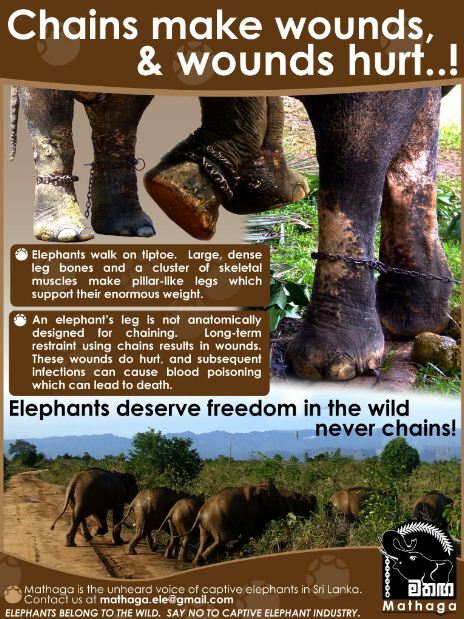 The team is dedicated to make a change for the betterment of these elephants. Mathaga’s first approach is to raise awareness locally and internationally about this issue. Mathaga graciously granted Elemotion the use of a few of their e-posters, part of an awareness campaign. EMF: When and how did you first decide that you wanted to get involved in Asian elephant welfare? I was looking for a holiday with an animal connection and a friend suggested the Elephant Nature Park, a park where visitors may enjoy an up-close experience with elephants who do not have to work. I heard Lek Chailert (founder of Elephant Nature Park) speak with passion and love for elephants and it changed my world. I became aware of the plight of Asian elephants. 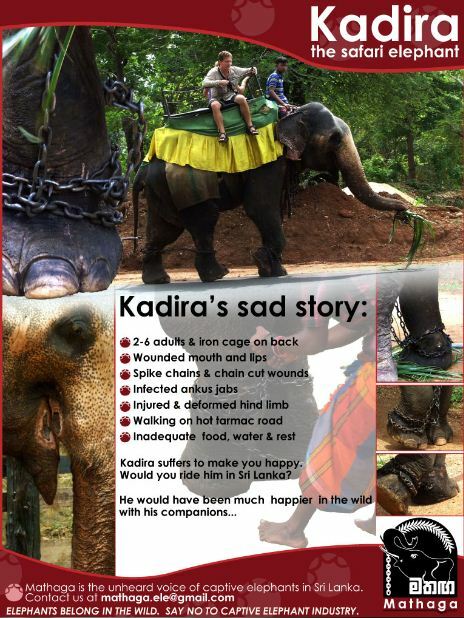 I learned about the cruel training methods and the suffering of working elephants. I knew then that I needed to speak out about the abusive practices that so many animals have to endure, from elephants used in tourism to circus animals, and even zoos. Most people would not willingly support animal cruelty. If they were made aware of the brutal training methods and the ongoing pain and distress of working elephants, they would put the welfare of elephants before their own pleasure. Given the choice between seeing an elephant at work or an elephant in a sanctuary, I believe they would choose to support sanctuaries where elephants are treated with compassion and respect. EMF: Why do you think it is important to help?EMF: Why did you decide to create this display in your local library? I asked our city library if there was a place where I could leave a few Elemotion brochures. The librarian suggested I do a display since the topic was a community message, and thus the opportunity to do a display was offered. EMF: What did you include in your display? On the main display board was the information on the true lives of elephants used in tourism. There were also brochures on a table for library patrons to take. 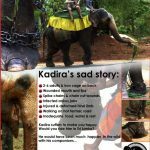 There were two styles of brochures, one style about the mistreatment of elephants used in tourism, and the second style from sanctuaries where tourists can get up close and interact with elephants in a manner that is humane and fair to both elephants and tourists. I believe it is important to cover both the why and the where of ethical tourism. I also displayed various elephant books and dvd’s in a cube. EMF: What kind of reaction have you had from the display? Our library has approximately 55,000 people go through its doors per month. The display was up for two weeks (although one week only is usually offered). I phoned the local newspaper and they did an article on the display in the community paper. I base the success on the number of brochures that were taken. I had 6 different styles of brochures, including Elemotion, Friends of the Asian Elephant Hospital, Elephant Nature Park, Boon Lott’s Elephant Sanctuary, and others. In all, I had around 200 brochures. Before the display closed two weeks later, all but 1 brochure had been taken. I also stood back and watched as patrons saw the elephant photos and came up to the display. Most of them would read the main display board and then take one or two brochures before moving on. Sometimes I would chat to people about the message on display and each time I was made aware thatthe lack of knowledge plays a major part in the elephant tourism ‘industry’. EMF: What is the main message that you would you like to give to the general public? I believe that the main message is for people to look beyond what they see. 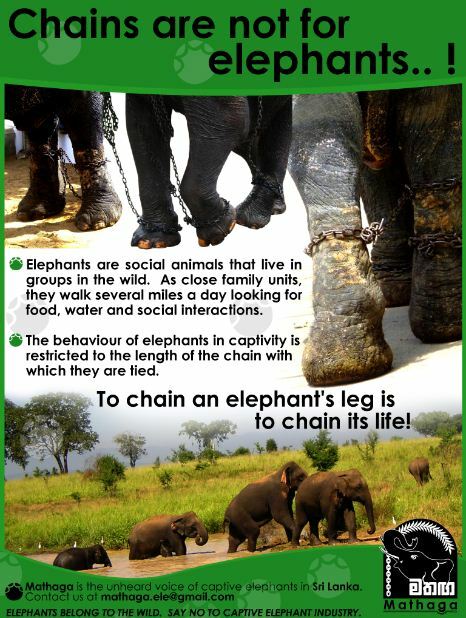 Be aware of the suffering endured by elephants disconnected from the lives they were born to live. And, they need to promote ethical elephant tourism, where elephants get to be elephants, doing elephant things. The adult elephants doing tricks in shows may be entertaining, and the baby elephant entertaining guests at a local beachfront hotel may be cute, but this is where we need to step back and think about what we are seeing: how were the elephants trained, how do they live when they are not performing, how old is the hotel greeter baby, where is her family, how many hours a day is she chained, was she put through the phajaan. EMF: Can you recommend other ways that people can help? An easy and effective way to help is to get people talking and thinking about elephants used in tourism. Every time I see an elephant (statue, gift, painting, t-shirt) I go into the store and comment. If the elephant is performing, I talk to the store owner about the elephant suffering and leave a brochure. If the elephant is in a natural surrounding, I tell the store owner how good it is to see ethical elephant promotion, and leave a brochure! Hiking stores and travel agents are good places to leave brochures. At the very least the person who takes the brochure from you will read it, and at the very best, they will act positively and take the message on board.